Virginia City, Nevada is quite the place. The area’s history as an old west mining town has been used to turn the town into a tourist mecca. I’m betting that most people who visit are interested in the main street of funky western shops, bars and eateries. Well, we aren’t most travellers. We choose a quiet walk around the Silver Terrace Cemetery and we did not feel we had missed out on a thing. Here is what I picked up from one of the informative signs. Established in 1867, the thirty-acre cemetery was once fully irrigated and sustained a wide variety of non-indigenous flowering plants and trees. 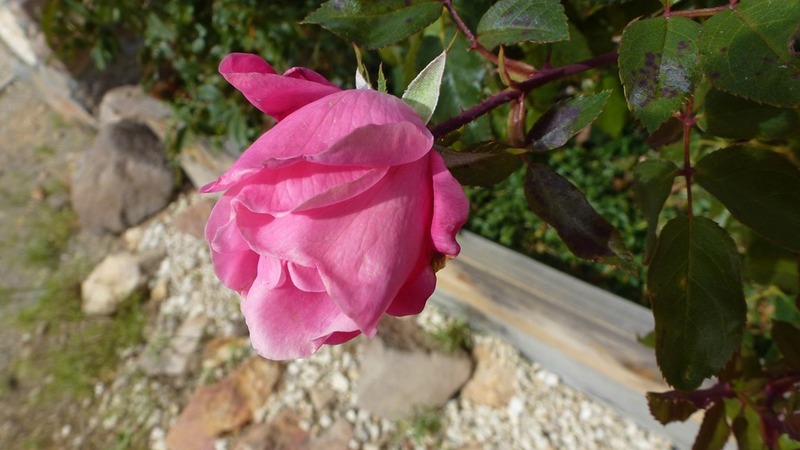 A stroll through the shady, rose scented paths tapped into the senses in a transformative way. I was surprised to learn that these early cemeteries were so beautiful and inviting that they became the forerunners of the public parks system in America. Silver Terrace is an American West collective memory. Filled with symbols that emphasized a belief in everlasting life, a stroll through the cemetery immerses one in a socially infused cultural landscape. 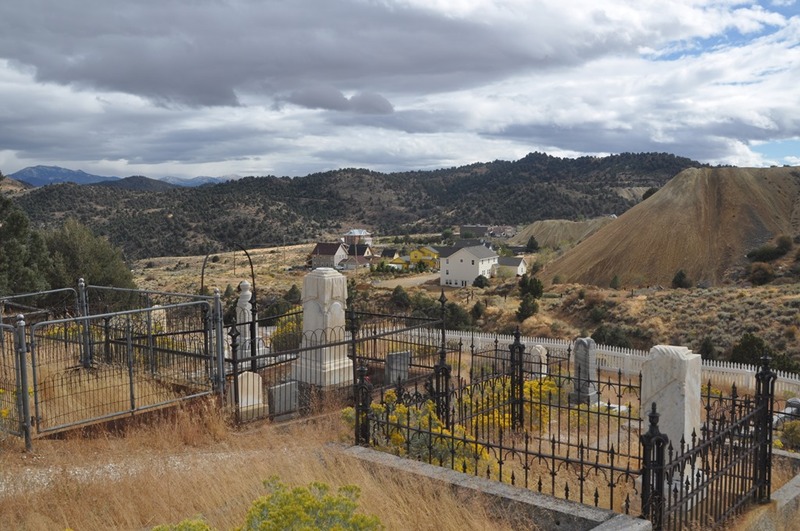 These grounds was once described as the loveliest place of burial in Nevada. Not so anymore. A vast majority of the grave markers have been stolen or vandalized. 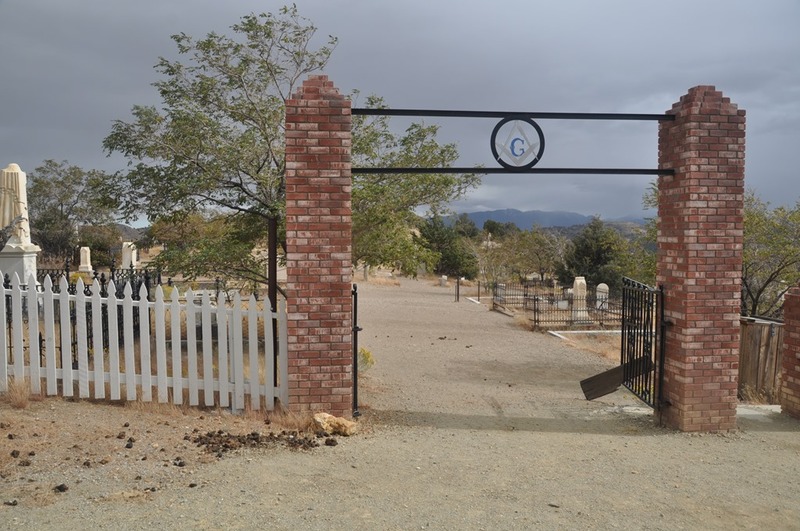 In 2005, such theft became a crime in the state of Nevada and the cemetery is now remotely monitored twenty-four hours a day. This has served to halt the devastation. 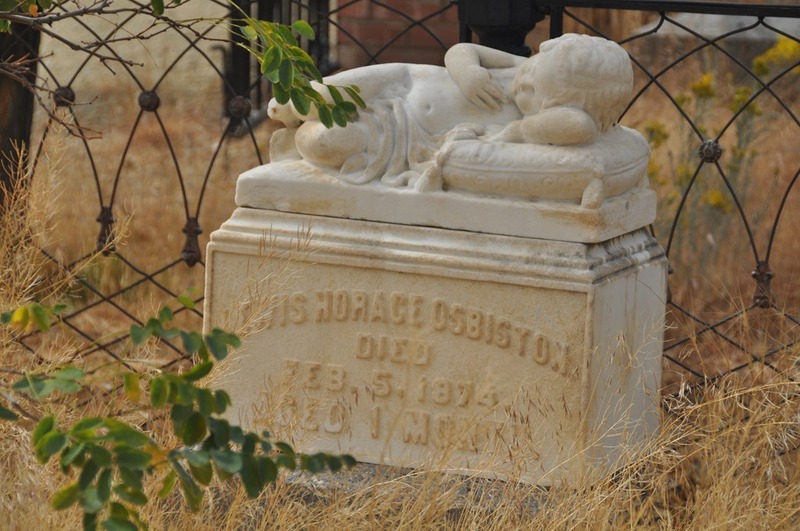 I was taken by the sadness of this stone – baby Horace lived only one month and died on the same day my daughter was born – albeit one-hundred and eight years before! 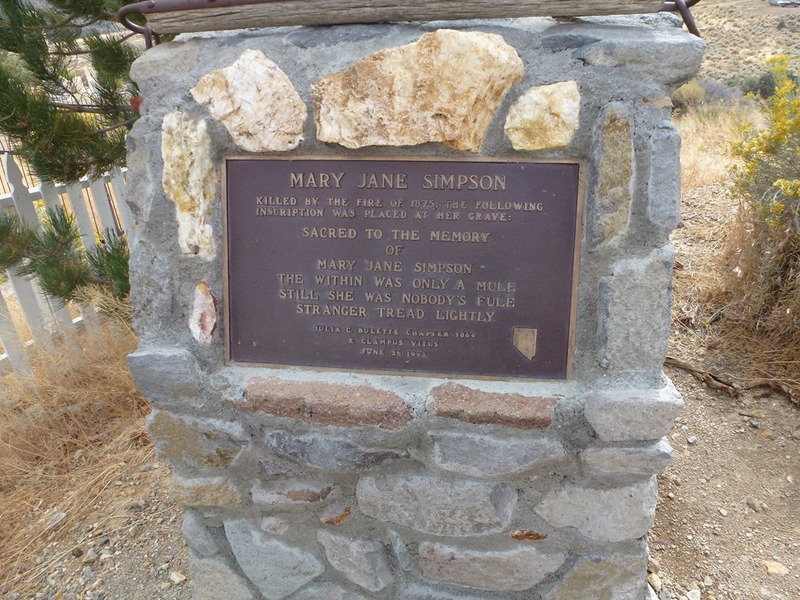 I wondered about Mary Jane Simpson. Was she actually a mule or just a woman who could be mulish when it suited her. 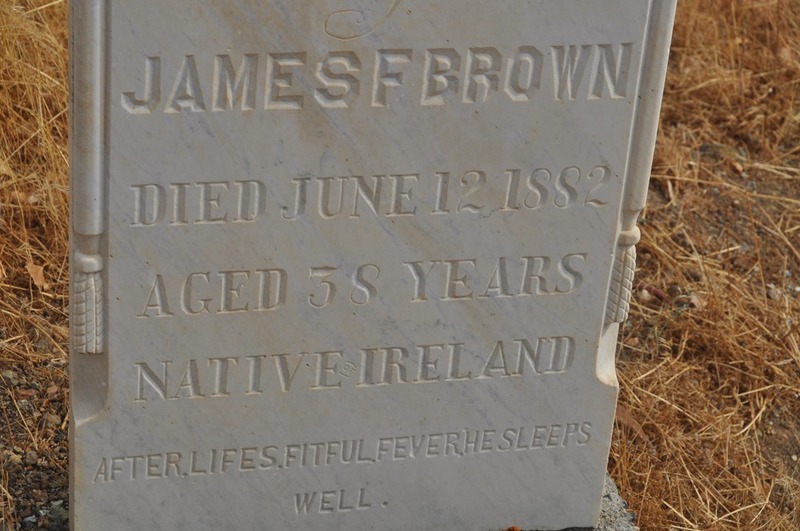 And what more can be said of James F. Brown from Ireland but that after life’s fitful fever, he sleeps well. May we all be immortalized with such simple yet significant words. 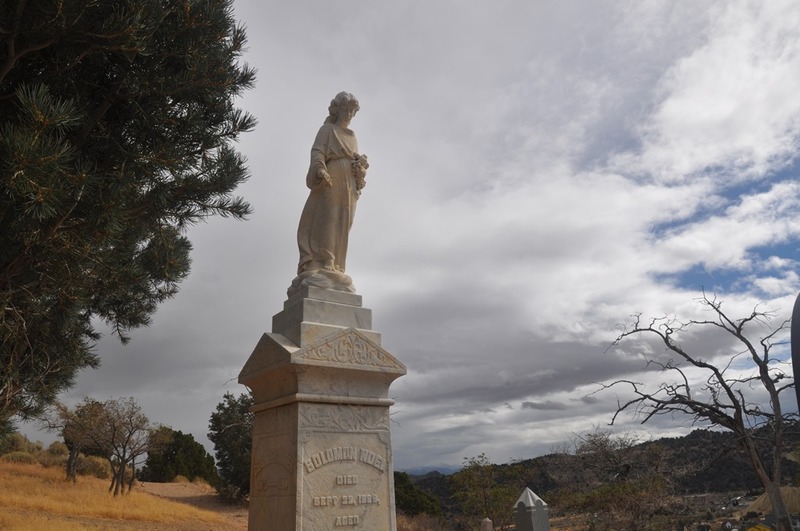 This entry was posted in Gardening, Life, Photography, Travel and tagged cemeteries as cultural landscapes, cemeteries as precursors to parks, cemeteries of the 1800's, Silver Terrace Cemetery, Virginia City Nevada. I do enjoy the park-like grounds of cemeteries; but they are also fascinating in an unkempt state. I feel sad when they are completely abandoned though. Yes – I, too, felt saddened that perhaps in a less-aware era people felt the need to devastate beautiful grave markers to obtain a souvenir of the sight. Maybe that is a faulty assumption – maybe the grave stone toppers were taken and reused. Interesting from so many perspectives. I’m with you and Bruce Fran. Cemeteries are fascinating and this one looks gorgeous. Why would anyone choose to desecrate it and steal things? Gravestone inscriptions always make one wonder about the unrecorded lives of those interred there don’t they? We have spent many hours wandering cemeteries and getting a deep sense of an area as evidenced by the populations life spans in a given era, grave stone markers and inscriptions and various other artifacts that end up in such places. It is always a restful experience. My husband and I walk almost every Sunday with friends in the area of south west Scotland where we live and the walk very often includes a graveyard. We have found headstones that reveal amazingly interesting people and events from sometimes hundreds of years ago. I enjoyed your blog. what an amazing place! It pleases me to think of James F Brown sleeping well.